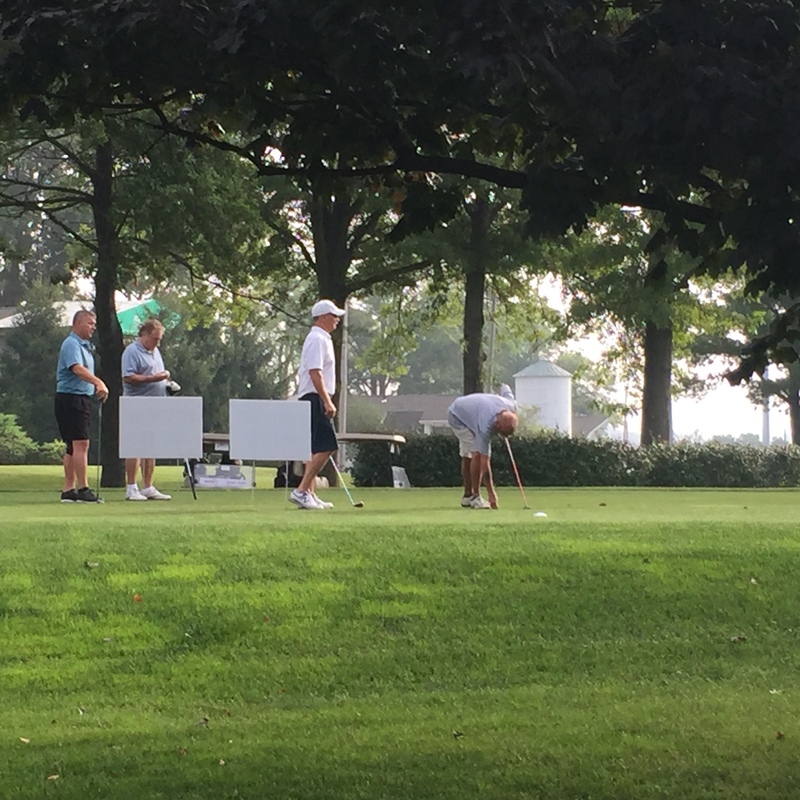 Over 120 golfers came out to support the special needs community of Fairfield County and to help our Veterans With PTSD. STAND FOR THE TROOPS (SFTT) whose mission to identify and support alternative therapies for Post-Traumatic Stress was present as one of the recipients of Tournament proceeds and to spot light the importance of PTSD Service Dogs. As advocates for American Combat Veterans struggling with invisible war wounds SFTT recognizes the importance of both PTSD Service and Companion Dogs while the VA is still researching the benefits. These dogs are amazing, they help reduce medical costs, suicidal thoughts, the risk of violence, alcoholism, drug use, and depression as well as serious mental breakdowns. And with the help of these dogs veterans report feeling safe, protected and loved unconditionally. They often become more social, return to work or college and are more connected and able to care for their families. In recognition of National Service Dog Month SFTT launched Service Dog Salute and asked Veterans to shared photos and the stories of how their canine companions have impacted their lives. The first of two awards was chosen at the Golf Luncheon held at Knight of Columbus in Stamford CT. So, we’d like to congratulate MaryAnn Dyer and her faithful companion Wookie who will receive a year’s supply of Dog food. The second recipient will be announced at the end of September. The Knights of Columbus hosted the event aims to Level the Playing Field by funding scholarships, and programs for those with special needs as well as Veterans with invisible war wounds. The community support is always tremendous for the tournament which is in its 28th year and offers great incentives out on the course like a 2018 Toyota Rave 4 for a hole-in-one! Hope you’ll join us next year. STAND FOR THE TROOPS (SFTT) the David Hackworth Legacy Foundation joined The Knights of Columbus, Council 41 at the Frank J. Robotti Golf Classic on Thursday September 6th at Sterling Farms Golf Course in Stamford CT. Lunch with Open Bar was served immediately after the tournament at the Knights of Columbus, also in Stamford CT.
SFTT has partnered with The Knights of Columbus whose purpose to level the playing field for special needs individuals, dovetails with SFTT mission to protect American Combat Veterans struggling with invisible war wounds. So important the mission, especially now, with so many military suicides – 22 a day – SFTT is committed to funding effective treatments for Post-Traumatic Stress (PTS) and Traumatic Brain Injury (TBI). This year’s proceeds will help SFTT fund local PTSD Service Dog organizations and supply dog f food for Veterans with PTSD Service Dogs – many of which survive on a limited income. Enroll 20 Vets in university level hands-on Sustainable Agriculture Training, a therapeutic experience that equips them for post military careers. Your support will help SFTT continue to improve the lives of more American Warriors and their families. All Digital Art should be emailed to maura721@optonline.net. Logo art received by 7/31 will be included on event poster distributed in Fairfield County. All Logos will be displayed on SFTT website and social media outlets. All art must be submitted no later than August 20th. Any questions phone 203-629-0288. Checks can be made out to Frank J. Robotti Golf Classic, c/o SFTT, 260 Riversville Road, Greenwich, CT 06831.